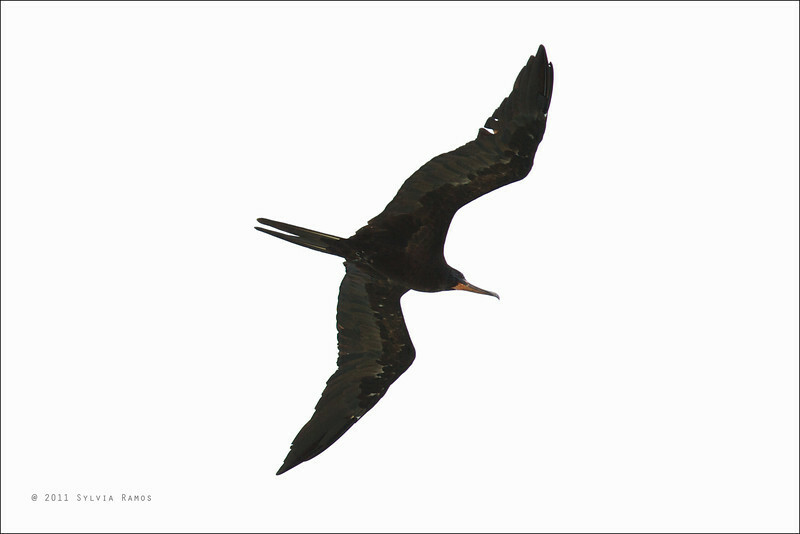 Great Frigatebirds are 37" long and have a wingspan of 83". The male adult Great Frigatebird has a black head and all black underparts. It does not have an axillary spur (white feathers in the "armpit" area). It has a gular sac or throat pouch. The female adult Great Frigatebird has a black head, saddle-shaped black belly that is more widely round at the anterior point, white breast that is often smudged with rufous and grey, greyish or mottled throat, no clear hind collar, pink bill (in the China Sea), and red orbital ring. Frigatebirds are also known as "men-of-war" because of their flying prowess and habit of chasing other seabirds to make them regurgitate their food. They will then either catch the food in the air or scoop it out from the water. Doc Teri Aquino of the Tubbataha Management Office told us that when they were tagging birds at Bird Islet a few years ago, some of the birds would throw up on them out of stress. They probably thought that they were being harassed by an extra large frigatebird! Frigatebirds have tiny feet and non-waterproof plumage, so most of their acrobatics are restricted to the air. One of the most well-known images of a frigatebird is that of a male Great Frigatebird from the Galapagos Island with its bright red throat pouch inflated like a balloon to attract a mate.